Residents in the San Juan Area of San Pedro Town were upset after an establishment in the neighborhood began dumping what appeared to be waste material onto the street. On Friday, December 7th The San Pedro Sun received information of a pungent odor plaguing the residents of San Juan. 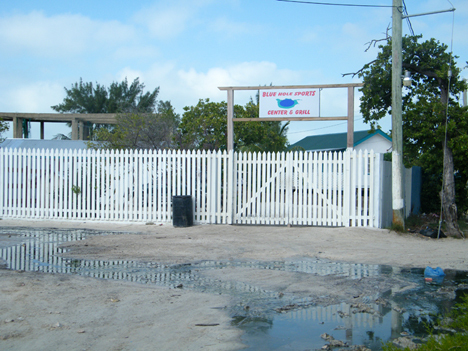 Investigation into the matter lead to the discovery of a liquid substance being pumped from within the property housing the Blue Hole Sports Bar and Grill onto the street, corner of Seaweed and Ziricotte streets. Upon arriving at the area, The Sun became immediately aware of a putrid stench which dominated the air in and around the establishment. The source of the stench appeared to be a small diesel pump which was observed pumping a thick dark liquid from within the property onto the road. The thick black liquid drained down the street directly into the lagoon. Residents of the area were very concerned and with much reason. 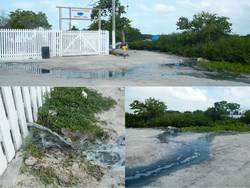 Health Inspector, Lisa Tillett stated that while she was off the island, she was informed of the problem and that a representative from the Health Department was asked to assess the situation. She further stated that permission was granted to the owner of the property for the septic tank to be constructed. While the existing structure did have a septic tank, due to the fact that there are plans for expansion, the need for a new and bigger septic tank was inevitable. She explained that her investigation showed that due to the fact that the area where the tank is being constructed is very low, it was only natural that the hole became full with ground water. "The water table for San Pedro is so high, while they were building the septic tank, the water that filled the hole as a result needed to be bailed so that the bottom could be sealed. Certain parts the land have a very high concentration of sulfur and it is the sulfur that causes the very pungent smell, mixed with decomposing landfill and so forth, the smell was multiplied". An interview with Mr. Juan Alamilla, Councilor responsible for environmental issues on the island further confirmed what Ms. Tillet had informed us. 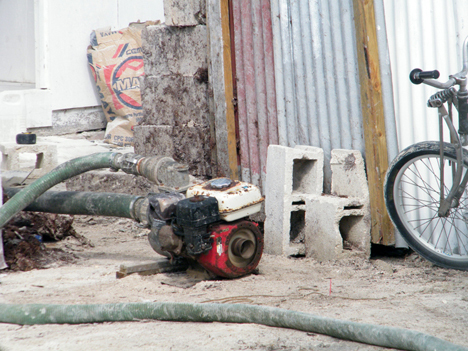 He assured The San Pedro Sun, "There is no waste being pumped over there" and clarified that the need for the new septic tank is to accommodate the rooms that will be placed on the property. While both individuals confirmed that there was no human waste material being pumped out, they both agreed that there could have been a better way of ridding of the water. One suggestion was to create a leach field where the liquid could have been pumped into. This would have alleviated the need to pump the water onto the street as well as minimize the smell that plagued the residents. In essence, both agreed that the problem was as a result of poor judgment by the contractor, who was unavailable for an interview. Coral Reef Ed-Ventures Says “Thank You”!